Bluetooth Headsets with super long battery life, 20 hours or more, enough to make you forget about the power socket for a while. Unfortunately, smaller in-ear wireless headphones are not making the list as these generally last no more than 8 or 9 hours per charge. Here is our line-up of the best wireless headphones with long battery life and to top it off, active noise cancellation so nothing gets in your way of enjoying your music. From big names like Bose, Sony and Senheiser as well as new comer, Libratone, here are five of the best headphones with battery life up to 20 hours or more. The Bose QuietComfort gets better each generation. Here is Bose’s flagship headphone with best-in-class noise cancellation and long battery life in wireless or wired mode. Libratone, the Danish company first with an impressive line of Bluetooth speakers is now sinking their teeth into headphones. Equally impressive, the Libratone Q Adapt On-Ear Wireless Bluetooth headphone does not only have super long battery life between charge of over 20 hours but offers active noise cancellation. It comes with the familiar touch interface found on their line of speakers that lets you control your play back (play, pause, change track), activate hush function or increase and decrease the volume. The active noise cancelling function or what Libratone like to call CityMix is adjustable, you can choose to let the conversations in if you wish or cancel out the noise entirely with a touch of a button. And, should you run out of charge on a super super long haul, you can use the wire to continue listening to your tunes. It takes only 3 hours to fully charge up again and is capable of connecting to another set over Bluetooth to enjoy the same music together. That is not all, you also get a free companion app to download to fully customise your experience. If you have the speaker, the palm over the bird logo gesture better known as “Hush” works here too. If you need to listen a train/plane announcements or wanted a quick conversation, use the gesture to let sound in. The headphone performs very well if not better than the Bose QuietComfort QC35 if you prefer on-ear headphones instead of a over-ear set. 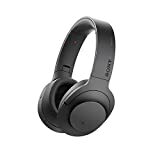 The super comfortable H.ear Wireless headphone from Sony not only sounds good with digital noise cancellation but looks good too in a choice of colours. 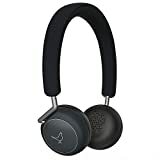 The headphone is foldable and is priced to compete with some of the more expensive options here. High-Resolution Audio for uncompromising sound – experience digital music to the fullest with High-Resolution Audio. Digital Noise Cancelling for fewer distractions reduces a variety of ambient noise when listening to music. Two microphones built in to the headphones, one outside and one inside the housing, work with the digital noise canceling engine to cut out unwanted sound. NFC One-touch for instant connectivity with NFC-enabled device. Clear hands-free calling with built-in microphone and HD voice support. Dynamic HD 40mm drivers deliver authentic sound: 1.57 in High-Resolution compatible HD driver units reproduce frequencies up to 40 kHz and deliver a powerful, responsive low range. Maximum transfer rate: 990 kbps (approximately three times more data than conventional Bluetooth® audio). 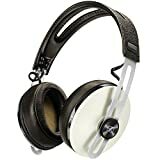 Sennheiser Momentum 2.0 Wireless is a stylish, retro looking can with active noise-cancellation. 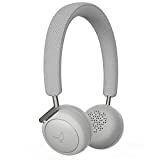 It also folds up for compact storage and features excellent sound over Bluetooth and wired connections. The Sennheiser Momentum 2.0 is the 2nd generation of the range bringing enhanced comfort, folding ear pads and Active Noise Cancellation. Featuring Bluetooth® technology with aptX, the Momentum 2.0 can stream music directly from compatible devices, releasing a CD-quality sound for up to 22 hours. Control the sounds and calls from your Smartphone with an integrated in-line mic/remote. A new hinge system on the ear cups allows for the headset to be folded up and conveniently transported or stowed away. Exclusive materials such as stainless steel and real leather luxuriously finish off the overall appearance of the Momentum 2.0. 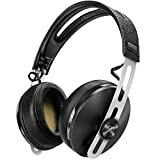 The closed-back design of the headphones help to create a truer sound-scape while cutting down on background noise and sound leak. 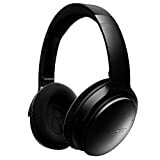 Another comfortable wireless headphone from Senheiser, the new PXC 550 hits the spot with frequent travellers especially with its foldable design, stylish look and ultra long battery life. Use CapTune app from Senheiser for more control over your music.